In less than a day, my kids will be back in school, and once again I will have to figure out what to pack in my kids lunches. My kids all have their food likes and dislikes, which make things a little harder for me. High Schooler will probably pack her own lunch. I have been asking her if she wants me to buy anything in paricular from the store, but so far I have not received an answer. She just said she will pack whatever. Middle schooler who has Aspergers tends to stick to a few items that he likes, and rarely wants something different. His lunch consisted of a sandwich, chips and pudding cup. Occasionally he would take a hard boiled egg. He did tell me he might try something new this year. That is yet to be seen. 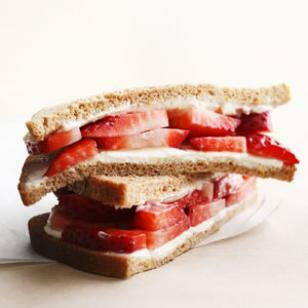 5th grader does not like to eat normal sandwiches. She tends to want to eat snack type items, and she eats like a bird. A typical lunch last year consisted of a cheese stick, yogurt, something crunchy, and maybe some fruit. Half of her food would come home because she was too busy talking and did not have enough time to eat everything. 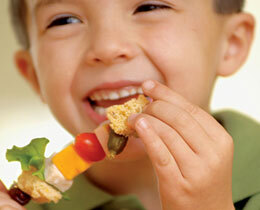 I have been searching online for some easy and nutritous ideas that hopefully at least 2 out of 3 of my kids will eat. I think that this sandwich on a stick from Family Fun might be a go for 5th grader. 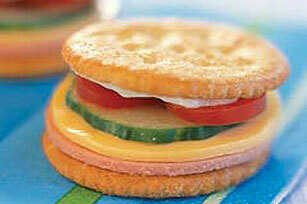 She could eat her favorite snack foods and technically it is not a sandwich. 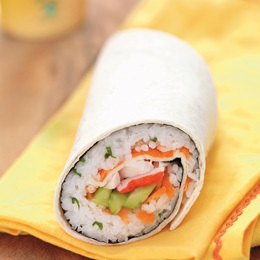 This California Roll Sushi Wrap fron Family Fun might be good for the high schooler. She likes sushi and wraps. I found this link orginally on 5dollardinners.com. She has many different fun themes that I am definitely going to go back and through through. One that caught my eye right away was lunches with personality on the blog by Lisa Storms. She has several fun items with faces and personalities of their own.